What is wrong with using mechanical switches? So what is the solution to these drawbacks? 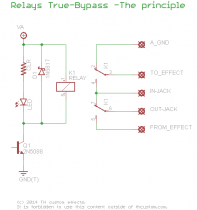 A good way to solve all of the above issues is to use a relay. Thats nothing more than a mechanical switch controlled by a magnetic field. So its a mechanical switch again – why is it different? Its different because mechanical stomp switches are sturdy and large devices – just because you stomp on them. Relays can be much smaller and switch more accurate because there is not much mechanical impact to them. And they are controlled by an electronic circuit which allows a few fancy things to be done. Looking at the switching-side we see that there are also two double-throw switches in the relay. So we have the same standard wiring here like we have in the standard wiring diagram for the mechanical switches. On the left-hand-side there is a transistor in this circuit. If no positive signal is applied to the basis of the transistor the connection between collector and emitter is broken and nothing happens. So far this is all that is to it but what do the other components do? D1 is a protection diode which protects the rest of the circuit from a negative spike that occours when the magnetic field is shut down. The indicator LED and its current limiting resistor are connected parallel to the relay and are switched on together with the relay. 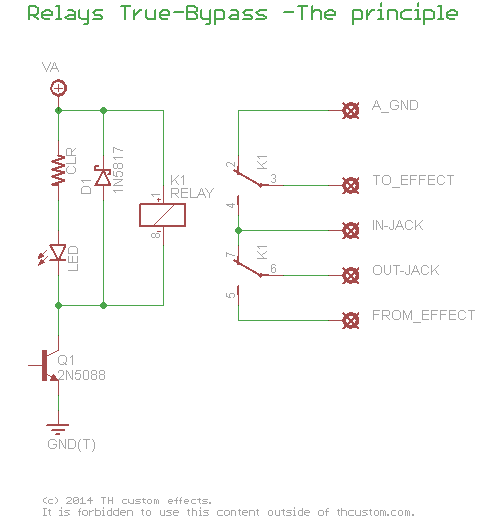 The above circuit is basically the same in all relay true-bypass circuits using a non-latching relay. But there is a very big difference to what actually switches the relay.